Vallon-Pont-d’Arc is a wonderful commune situated in the southern part of France, in the department of Ardèche. This small, but very attractive village is extremely popular among visitors. During winter months the village is very peaceful, but during summer the number of visitors is about ten-fold the population of Vallon-Pont-d’Arc. You may have already heard about this scenic village, but if you haven’t, the following guide might help you make the final decision about visiting it. The Ardèche River plays an important role in the formation of the landscape. The Gorges de l’Ardèche and the Pont d’Arc are two of the major visitor attractions of the region. Visiting the wonderful Vallon-Pont-d’Arc and its surroundings is with no doubt a memorable experience. Perhaps the major and most beautiful tourist attraction of the region is the Pont d’Arc. 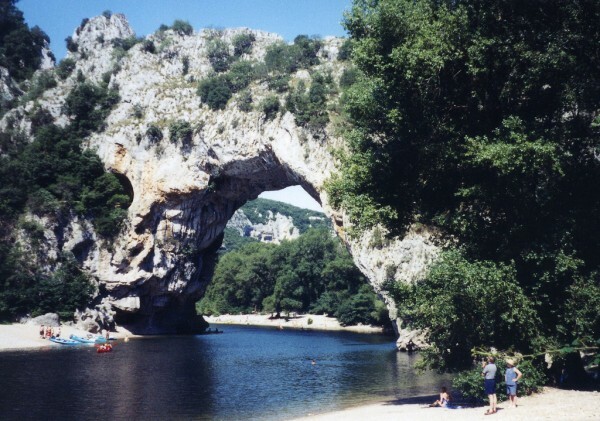 It is actually a huge natural bridge over the Ardèche River, situated about 5 km of the wonderful commune of Vallon-Pont-d’Arc. The arch is over 50 m tall and about 60 m wide. The breathtaking Pont d’Arc is very attractive for the lovers of kayaking and canoeing, as these activities are common here. The natural bridge is also known as the entrance to the Ardèche Canyon. Another fantastic visitor attraction in the vicinity of the Pont d’Arc is the beautiful Chauvet-Pont-d’Arc Cave (or the Chauvet Cave simply). If you visit the wonderful commune of Vallon-Pont-d’Arc, I suggest you to visit the Pont d’Arc and the nearby cave. 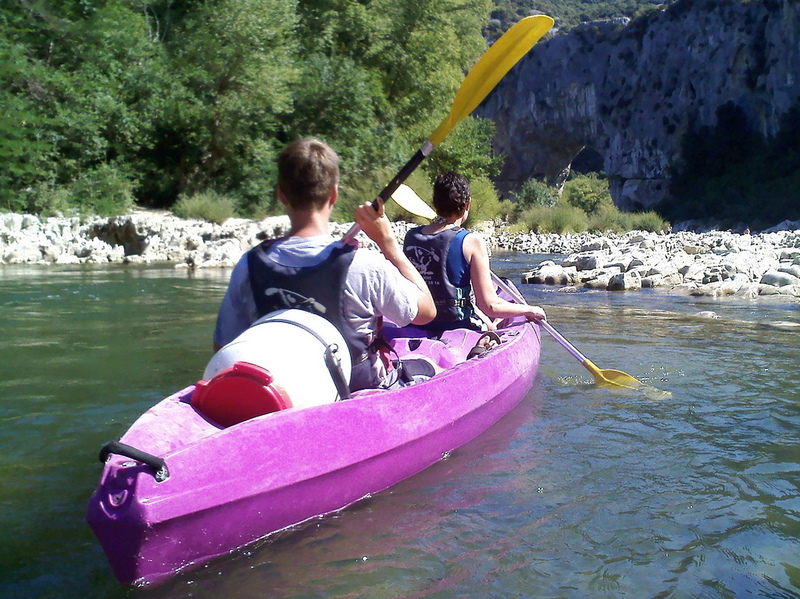 The beautiful Ardèche River forms a breathtaking valley and a section of about 30 km of canyon named the Gorges de l’Ardèche. It is an extremely attractive tourist destination for the lovers of nature. The section situated nearby the commune of Vallon-Pont-d’Arc is very popular among visitors due to the presence of the astonishing 60 m Pont d’Arc (stone arch) and the Chauvet Cave. The walls of the river at the canyon are formed of scenic limestone cliffs which reach the height of 300 m. Kayak- and camping trips down the canyon are very popular during the summer months and technically not difficult at all. As I already mentioned it, the wonderful Chauvet Cave is another attractive landmark of the region. Although the cave is not open to the public, there is an exposition site which was created as a copy of the cave. 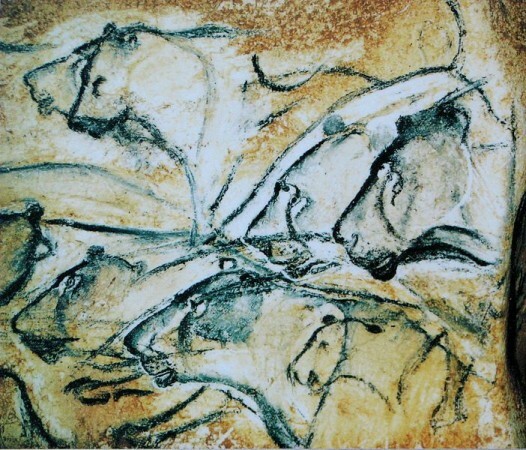 The cave is famous for presenting the oldest Paleolithic paintings which date back in about 32.000 B.C. The commune is a very beautiful settlement which attracts dozens of visitors due to its astonishing visitor attractions and breathtaking surroundings. Besides the previously mentioned major tourist attractions, there are some other sights here, too, including the museum of the Chauvet Cave, the Gorges de l’Archèche National Park and the beautiful town hall which is famous for its interior.